Be the first to share your favorite memory, photo or story of Wayne . This memorial page is dedicated for family, friends and future generations to celebrate the life of their loved one. 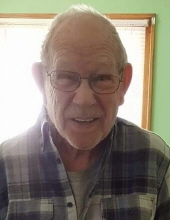 Wayne Eldon Hart, 84, of Loves Park, IL passed away Monday, February 4, 2019. Born December 16, 1934, in Lime Springs, Iowa, the son of Arthur and Ada (Dodd) Hart. Veteran, serving in the U.S. Navy. Married Marlys Lee on March 11, 1962, in New Hampton, Iowa. Employed by Modern Metal Products, retiring in 1997. Wayne was an avid golfer. Survivors include his wife, Marlys; sons, David (Cheryl) Hart and Dennis (Margaret) Hart; grandchildren, Joshua Hart, Brian Hart, Dennis Hicks, Crystal Samp, Christiana (Tim) Pruner and Robert Cladwell; great-grandchildren, Caitlynn, Arayah, Jack, Maddie and Jon; brothers, Virgil (Margaret) Hart, Howard (Roxanne) Hart and Jerry (Karen) Hart; borther-in-law, Carlyle (Peggy) Lee of Durand, IL; Adis Lee of New Hampton; niece, Tracy (Dan Taylor) of Frederika, IA and many other nieces and nephews. Predeceased by his parents; brothers, Kennard and Gary; sister, Betty Jones; and great-grandson, Jason; father and mother-in-law, Arthur and Aleda Lee. Visitation from 5 to 7 p.m. Thursday, February 7, in Delehanty Funeral Home, Ltd., 401 River Lane, Loves Park, IL. Funeral 11 a.m. Saturday, February 9, in Conway-Markham Funeral Home, New Hampton, Iowa. Burial in Crane Creek Lutheran Cemetery, Jerico, Iowa. To send flowers or a remembrance gift to the family of Wayne Eldon Hart, please visit our Tribute Store. "Email Address" would like to share the life celebration of Wayne Eldon Hart. Click on the "link" to go to share a favorite memory or leave a condolence message for the family.